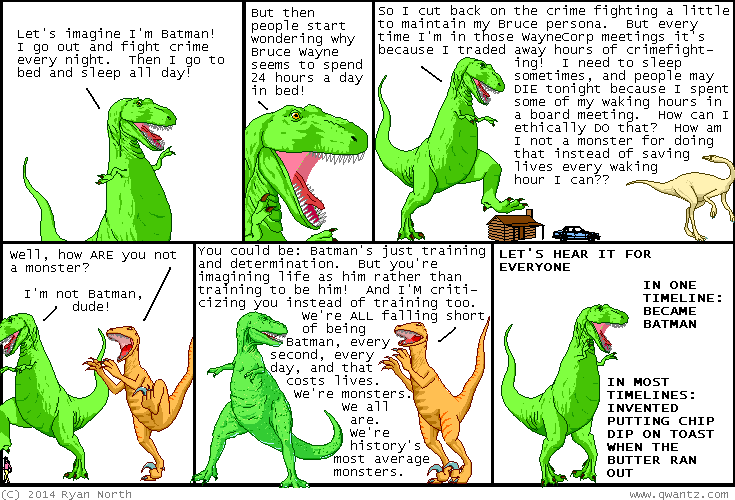 Dinosaur Comics - May 8th, 2014 - awesome fun times! –Thus begins the comedy of T-Rex and Cyber-Rex 2000! May 8th, 2014: TCAF is this weekend in Toronto! It's my favourite show of the year AND it's free AND it's in a gorgeous building (the Toronto Reference Library!). So if you're in Toronto, you should come and say hi to me and hundreds of other amazing cartoonists, and pick up some rad comics you won't find anywhere else! TCAF is seriously the best, you guys! One year ago today: totally fishing for that sweet google traffic coming from searches for "slappin' bums"